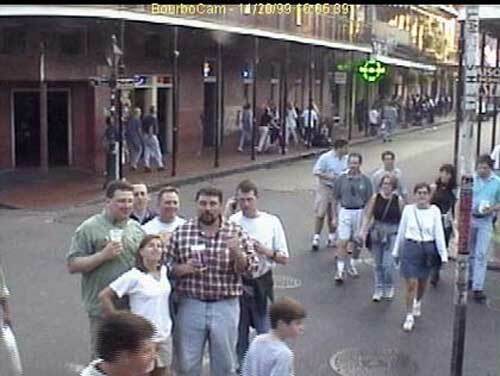 What are we doing in the middle of Bourbon Street? Good question. I think we were trying not to get run over by a Lucky Dog cart. On our first night in the Big Easy, Bryan Allen claimed illness and stayed back at the hotel. But wait a minute. Doesn't that wayward mime in the lower right look like someone with more than a passing knowledge of clustered web hosting environments? On our second day in New Orleans, we finally rounded everyone up for a photo (after considerable effort, left). 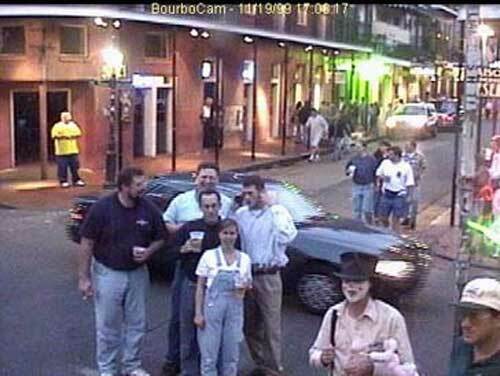 All the photos on this page were taken by NoLa.com's BourboCam, which is in the Cat's Meow at 701 Bourbon Street. In the larger photo above, we're the cluster of folks facing the camera toward the lower left of the image: Front row, from left: Megan "Luscious" Gray and Wes "Noodle Knee" Jackson. Back row, from left: Bob "Damn Yankee" Benz, Ron "Hand Grenade" Feinbaum, Bryan "Server's Down" Allen and Garrett "Sweetness" Lane (who is talking via cell phone to the esteemed Ron Lubke. Ron was back in Knoxville and saved the bottom two photos for us when they appeared on the BourboCam page. The photo atop the page was saved with an assist from Herb Himes.